5 Bedroom Detached House For Sale in Stoke-on-Trent for Offers in excess of £400,000. 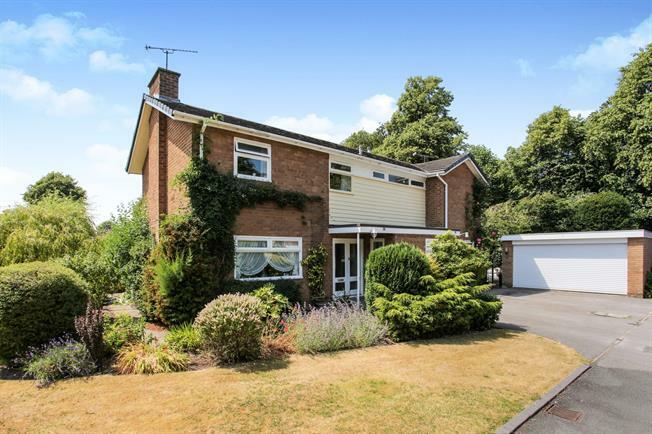 Looking for a substantial family home in a great location and occupying a large plot? The search is over as this fantastic residence offers all of this and more. Located in a quiet cul-de-sac along Church Road the property comprises of hall way, lounge, dining room, kitchen, utility, music/playroom room, study and WC to the ground floor. To the first floor the property offers four double bedrooms with en-suite bathroom to the master bedroom and a separate bathroom and WC. Throughout the property is spacious and the generous proportions continue as we head outside. With attractive gardens surrounding the property, ample parking and a double garage. Viewing is absolutely a must to fully appreciate the very many attributes this property has to offer. Entered via double doors, the large hall provides access to the ground floor accommodation and stairs to the first floor. Lounge with double glazed windows to the front and rear elevations. Carpeted flooring, fireplace and access off to the dining room. Dining room with double glazed window to the rear elevation over looking the garden and door accessing the rear garden. Carpeted flooring and access to the kitchen. Fitted kitchen with a range of wall and base units, sink and drainer and pantry. Double glazed window to the rear elevation and access to the utililty. Utility with fitted wall and base units, sink and drainer and plumbing for white goods. Double glazed window to the rear elevation and door to the side. Reception room with double glazed window to the front elevation, carpeted flooring and access to the hall. Study room with double glazed window to the front elevation. Carpeted flooring. Low level WC. High level double glazed window to the front elevation. Double bedroom with fitted wardrobes, double glazed window to the rear elevation, carpeted flooring and access to the en-suite bathroom. En-suite bathroom comprising of panel bath, low level WC and vanity unit mounted basin. Double glazed window to the rear elevation. Double bedroom with double glazed window to the rear elevation. Carpeted flooring. Double bedroom with double glazed window to the rear elevation. Built in wardrobes and carpeted flooring. Double bedroom with double glazed window to the front elevation and carpeted flooring. Double bedroom with double glazed window to the side elevation, built in wardrobes and carpeted flooring.